I get tired of trying to explain this and not being able to find a proper page through Google to link people to that explains things, so I'm going to do it myself. The static keyword in C and C++ has multiple different uses, so I'm going to clarify each one. The first two cases are the most talked about, and it's the third case that I'm really interested in going over. // need an instance of MyClass. // of MyClass, which f2() does not. // and I won't go into it today. // This next line is fine, but remember every instance of MyClass is sharing the same v2! Ah, the final case of static. To understand this one, first a basic understanding of how C++ code is compiled is needed. Let's say you have two source files, f1.cpp and f2.cpp, and you're trying to compile them together into a single program. There are actually a few stages in the compiling process. In the first stage, f1.cpp and f2.cpp are compiled separately as two different translation units. The compiler will typically generate intermediate object files, f1.o and f2.o, that represent the compiled versions of f1.cpp and f2.cpp, respectively. However, you still don't have your program, so the second stage of compiling* is started: the linking stage. *A more technically correct way of saying this is that linking is the second stage of generating your executable program (compiling was the first stage). Linking is what it sounds like: linking compiled translation units together to get a final executable (or library, if that's what you're making). f1.o and f2.o need to be linked together, and if they use any functions from other libraries (like the standard library), they have to be linked to the libraries as well. For example, let's say f1.cpp uses the standard library's abs function. The compiler will compile f1.cpp into f1.o, and notice that it's trying to use a function named abs. The compiler doesn't have the code for abs, as it's only working with f1.cpp, so it makes a note in f1.o that basically says, "Hey linker, the code right here is trying to call a function named std::abs; I don't have it. When you link things together, could you find a function named std::abs and patch this part to call that function?" When the linker comes in and starts linking f1.o and f2.o, it looks for dependencies that it needs to resolve, like the std::abs dependency in f1.o. The linker looks at all of its available symbols and says "Yeah, I've got an std::abs right here and its symbol matches the symbol that f1.o needs." If you ever compile a program and it gives you some "Undefined/unresolved symbol" error, it's basically the linker saying "The compiler compiled some code and asked me to patch a call to a function it didn't have access to (like in our std::abs example), however, I can't find anything that matches what the compiler said needed to go there!" Here, the linker complained saying there was a duplicate symbol __Z8functionv (which is just the mangled symbol the compiler produced that represents void function()). The linker doesn't know if it should use function() from f1.cpp or function() from f2.cpp. The solution is to mark one (or both) of the functions as static. The linker tries to share non-static symbols from translation units, and if there's a conflict, it errors out. It can't share static symbols, however (because that's the whole point of static in this case), so marking one (or both) of them as static means that the linker doesn't have the conflict of trying to share two symbols with the same name. Here, in this example, f1.cpp is able to call f2.cpp's privateFunction(), which may not be what you want. However, if f2.cpp had marked privateFunction() as static, then f1.cpp couldn't use it and the linker would error out saying it couldn't find a void privateFunction() symbol for f1.cpp to use. In C++, there's an alternative way to accomplish what this third use of static does. It's unnamed namespaces (sometimes (technically incorrectly) call anonymous namespaces)). I don't really like that StackOverflow question I linked to though, because in C++11, they've un-deprecated the static keyword when declaring objects in a namespace scope (7.3.1.1 paragraph 2 no longer exists in C++11). Also, note the subtle (but potentially significant) difference between static and unnamed namespaces in this answer. And there you have it! The three different ways to use static. And now I have a resource I can just link to when I need to explain this instead of googling in vain for a good explanation of the third case. 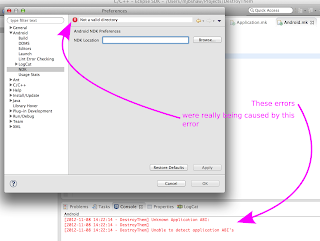 Android NDK + Eclipse: Fixing "Unknown Application ABI"
I've spend the past while hunting this down and have paid the price for not following instructions (though I thought I had). 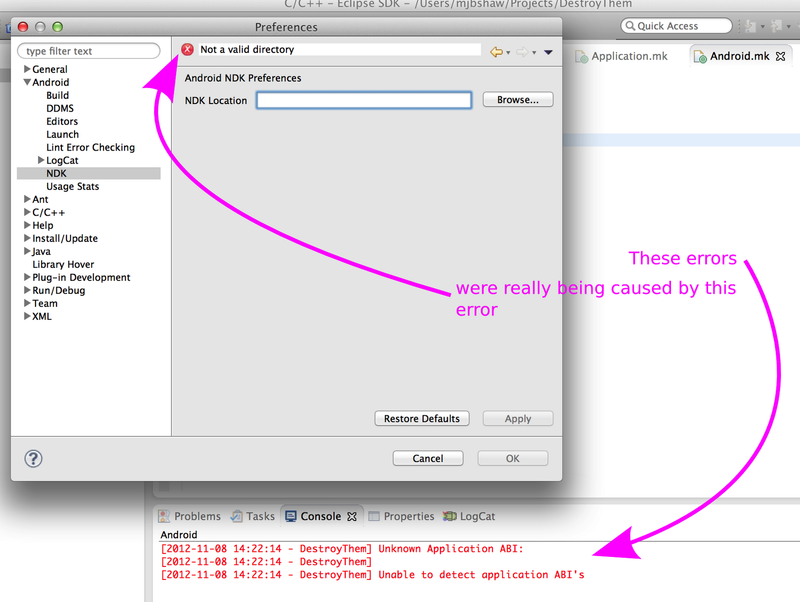 For the life of me, I could not fix the "Unknown Application API...Unable to detect application ABI's" errors I was getting when trying to debug my native Android app with Eclipse's NDK plugin and debugging as "Android Native Application." 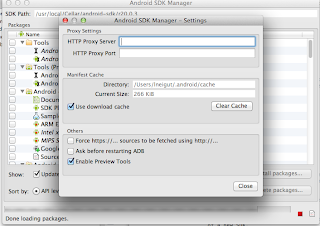 Here's what fixed it for me: set the Android NDK path in Eclipse > Preferences > Android > NDK. That's it. That simple. It was originally empty, but once I set it to the right path, Eclipse was happy, and I was happy. My new job at Pixio! I started working for Sorenson Media fall of 2008, and worked there until ~July 2009 when I left on an LDS mission to Cape Town, South Africa, where I spent the next two years. In August, 2011, just a week or two after coming home from South Africa, I started back at Sorenson Media. But today was my last day there. I wasn't planning on leaving, but an unexpected opportunity presented itself. I'm taking an Android programming class at the University of Utah. It's my first time ever doing any mobile development. I'm pretty proud of my work, though, and it seems my professor must like it too. One day after class he pulled me aside and offered me a job at his little startup, Pixio. It was a good offer, and since I'm so young in my career I thought I would greatly benefit from exploring this side of software development, so I accepted it. I'm sad to leave behind the great people at Sorenson Media, but I'm also really excited for this new opportunity to explore. Also, I'm really loving this 220ppi screen I'm typing on. I had to get myself my own computer, so I got the MacBook Pro with the Retina Display. I'm certainly no Apple fan, but I can respect good hardware. And pretty screens. I just had to say that, because I think the main reason I'm writing this is because I'm enjoying looking at text on the screen so much that I wanted to put more on it. Also, I almost never talk about my personal life on this blog, and I don't plan on making this a habit.